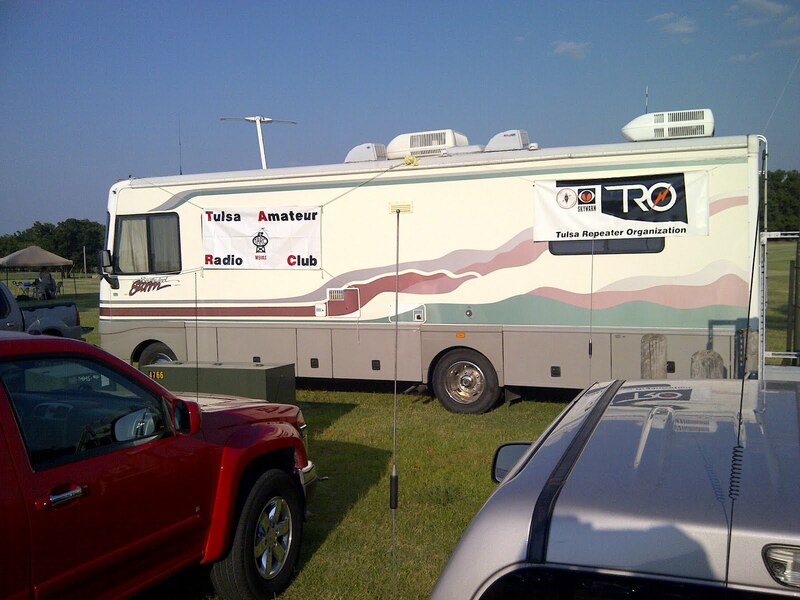 On August 18 beginning at 6:00 AM (Setup) the Enid Amateur Radio Club and ARES group will once again be helping with ALL communications for the Annual AMBUCS Tour de Trykes and Twilight Criterium. The Tour will begin early Saturday morning and should be over by 3:00 PM. The Criterium will begin at 6:30 PM and should be over about 9:30 PM. 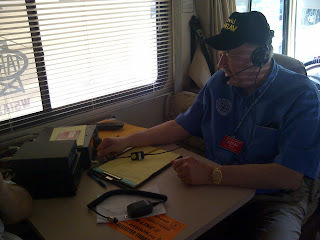 Tim McAnally - KD5KTB will be Net Control Operator for both events. There will be at least 2 and maybe 4 net controllers needed for these events. If you are interested in being a net control, contact Tim McAnally. We need at least 15 volunteers for the Tour and 10 for the Criterium in addition to the Net Control Operators. The tour will require air conditioned vehicles with external antennas and a 2 meter radio with at least 25 watts output. Each Tour volunteer will need to be prepared to be self sufficient during the day and carry at least 4 iced bottles of water. The water can be provided if you let me know prior to the event. We expect the weather to be HOT and everyone will need to stay hydrated. The criterium will require HT's and FRS radios. There are going to be several AMBUCS volunteers manning the intersections and we plan to provide an FRS radio at each of these locations. If you can provide an FRS radio for this event, please let Tim know. We will also need HAM's with HT's located at strategic locations on the course and some locations may REQUIRE a ham radio to communicate via the repeater to net control as well. I plan to have net control centrally located on the square for the criterium event with some of the same equipment from the Tour event. Setup will begin around 3 PM for the criterium. Tee shirts will be provided to those who volunteer prior to August 16th. After that, tee shirts will be on a first come basis and availability. The tee shirts this year will have the Club logo on them so they will be a nice keep sake. Please call Tim McAnally - KD5KTB at 580-747-5987 Or kd5ktb@arrl.net if you plan to be available for any part of these events on August 18. You can work as long or as short as you require, but we need your help. What's happening in the West Gulf Division? Gulf Division" and on our Twitter Page "ARRL_WGD." Division Amateurs come together to operate in collective force. Several of the Division Leadership members tendered Field Day reports. were preparing to try out a new and interesting HF antenna. providing their set-up team with a full belly of biscuits and gravy! Numerous activities followed and their day was a great success. planned a club fellowship dinner on Saturday night. 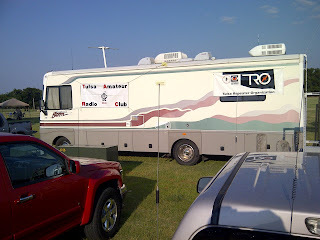 TRO/TARC, had a large number of operators actively making contacts. switch locations at the last minute and began setting up at 1:00 p.m.
order, including having its well-known communications trailer set up. contacts, added to the fun. keys and learned to transmit their names in Morse code. center of downtown Irving with an excellent turnout. over half of AARC's members participated and 24 visitors attended. link and continuously posted its operating scores to its website. serve as BARC's IT Section Chief for Field Day. total of 794 CW contacts, just missing his target of 800.
challenge the generator that accompanied them. surroundings and lots of shade provided for a great time had by all. to going back for more! recommendations to the Staff and the Board of Directors. people's lives and doing exciting things to interest youth in our hobby. can all help with this vital effort for the future of Amateur Radio. coordinating a volunteer body that consists of 27% of the membership. 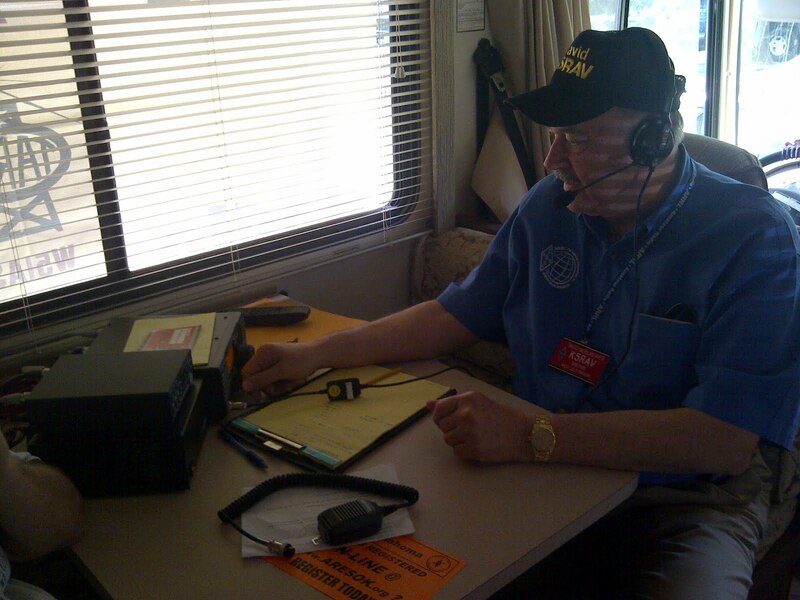 without the volunteer base, the ARRL would not be successful. Bureau Chiefs, Volunteer DXCC Card Checkers, and Official Observers. best to make sure that you as a member are heard and validated. too can make a difference. register for this webinar, please click here. --- Radio Merit Badge "Doubleheader"
Radio gear during the day-long event at the Plano Convention Center. convention by offering free admission and meals to Scouts in uniform. been through their program so far. 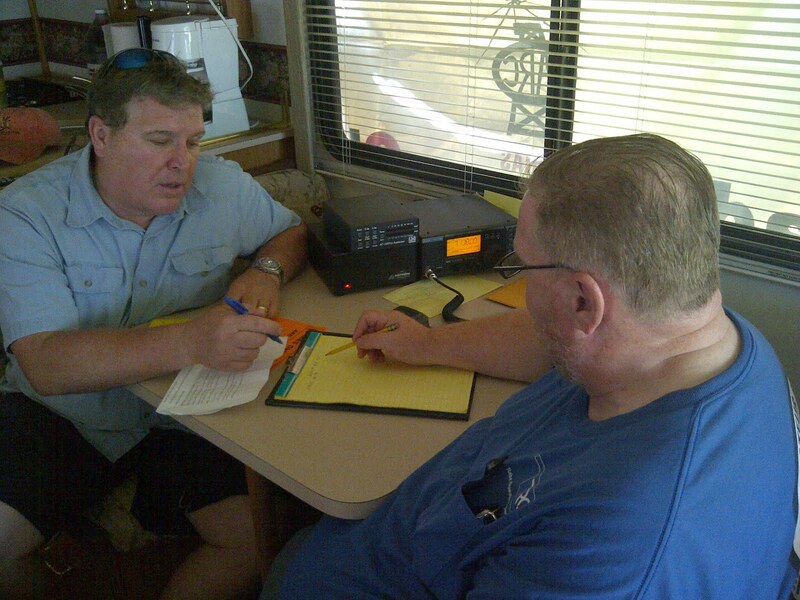 Amateur Radio license exam at no charge during the event. antenna courtesy of Ham-Com and Diamond Antenna Corporation. Merit Badge program—three times more than the classroom would seat! programs back-to-back in a single day. class is being planned for later this summer. imprinted with the ARRL diamond logo and words "ARRL VEC Exams." and the ARRL Forum on Saturday morning. reservations now as the two host hotels (next each other) fill quickly. Sponsor: Texoma Hamarama Association, Inc.
Hello to the sweltering section. I hope everyone is staying cool. Well, Field Day 2012 is in the books. West Gulf Division Director Dr. David Woolweaver and I had a wonderful time traveling around the central and northeastern part of Oklahoma. We toured 8 Field Day sites and were very impressed at the level of participation and the ingenuity of some of the set-ups. We started at Edmond with the EARS crew. They had an interesting antenna they were going to try out. Next we went to the FAA site in west OKC. They were starting Field Day out right with biscuits and gravy!! From there we traveled to Norman and the SCARS encampment….They had a large air conditioned tent on loan from the Oklahoma Department of Health. We then motored to Midwest City where the new Mid-Del club was set up for the duration. It’s nice to see a new group with all that spirit. Mark Hamblin, AE5MH Section Technical Coordinator was assisting them with their operation. David and I then drove up the turnpike to Shawnee where we found a small, but happy group of operators makin’ contacts. Then on to Tulsa and the TRO/TARC site in Chandler Park on the west side. Lots of operating going on and folks having a good time. They even had the HF Go Kit in operation. Then on to east Tulsa and the Broken Arrow club set up. LOTS of space for antennas and individual stations. Everywhere we were warmly greeted with a smile and a word of thanks for our attending their site. I can assure you it was our pleasure to make the circuit. We went by the Bartlesville site at Osage Hills State Park, but they had already packed it in…..something about everyone being tired after a big dinner….I don’t blame them……we ate and packed it in as well. I want to say thank you to all the clubs David and I got to visit. Other section officials attended other Field Day sites throughout the section. Next year, I’ll make some rounds in other parts of the state. Some photos from Field Day are on the Section News part of the League website. They will be at the bottom of the page. It’s been pretty quiet in the section otherwise. Propagation seems to be hit and miss. But 10 meters is seeing a lot more activity. Fall is fast approaching, start planning your fall license classes now. Don’t forget to get last fall’s new Tech’s on the upgrade path to General!! It looks like I will still be in the SM chair for another 2 years as no one wanted to run for the position….so, here I am. If anyone knows of a Boy Scout troop that would like to attend a Radio Merit Badge class, they need to come to Ham Holiday July 27-28 in OKC. The class will be given on Saturday the 28th. Here’s the info…..
Scouts in full uniform will receive a "free tour" of HAM Holiday and will be able to earn their Radio Merit Badge! Merit Badge session will be Saturday 9 am to 3 pm. Tours will be as time allows. Scouts will be able to compete merit badge requirements at the event. Lunch and workbook supplied. Cost is $10. Contact Gary Way at 405-613-4608. Find some kids to mentor…..a scout troop is a good place to start. Show them how to build a simple HF wire antenna and use it to let them talk to the world….. 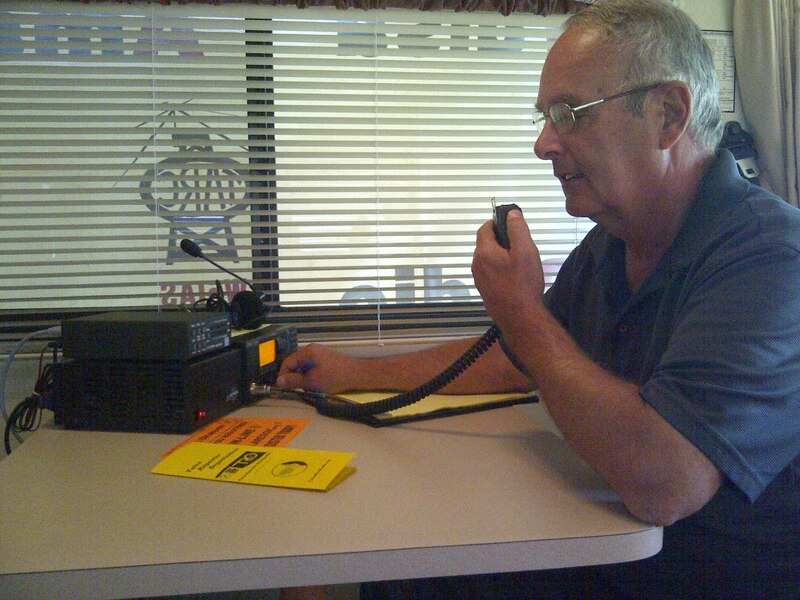 Remember Amateur Radio is personal……Make it Personal for someone else! The Exercise Design Team has reported that this event will disrupt communications. The exercise is an online tabletop and FREE during National Preparedness Month. How would you like to do Field Day in this? Dan Threlkeld, KF5FSL, left, and Doug Lee, KC5ZQM add to the Field Day tally. Even K5RAV got into the Field Day mode. Ed, K5CRQ, took his turn adding contacts to the log. Any other clubs have Field Day shots to share? Pass them along through your club Public Information Officer. Thanks to the Tulsa group for sharing these.